PS Head over to Funky16Corners for a Hammond burner supreme!. The record I bring you today is a cover of one of my all-time favorites, ‘Sally Go Round the Roses’. 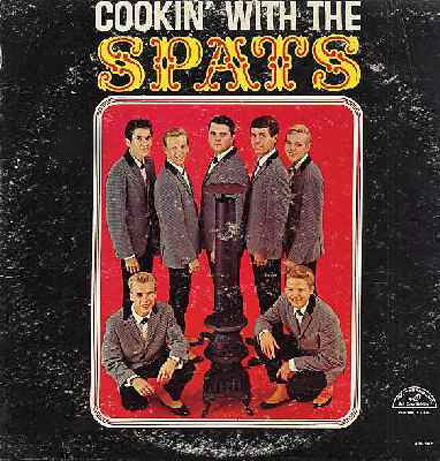 Originally recorded in 1963 by the Jaynetts (a group with an ever changing lineup), it was a sizable hit, and one of the spookiest, grooviest records of the 60s. While I would classify the original as a kind of fusion of girl group pop and soul, it really has a kind of a sui generis vibe to it. It was covered a number of times by artists such as the Great Society (featuring a pre-Airplane Grace Slick), and the Remo Four, but no one came close to the feel of the original. 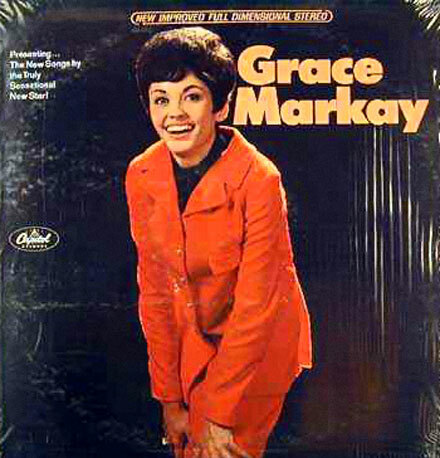 Until, that is, I happened upon the recording by Grace Markay. I saw this record on a friend’s sale list and bought it precisely because I’d never heard it before. I was banking on an unknown version of ‘Sally…’ as likely being interesting and my instincts did not steer me wrong. As far as I can tell, Markay (who now appears to work mainly as a contemporary Christian vocalist) had a modest career as a kind of a mainstream pop singer in the 60s. She recorded for Capitol and appears to have performed on the supper club circuit during the 60s singing a wide variety of pop material. If you take a look at the album cover above, she looks more like a 60s TV mom than a co-conspirator in an edgy recreation of one of the decade’s most unique records. 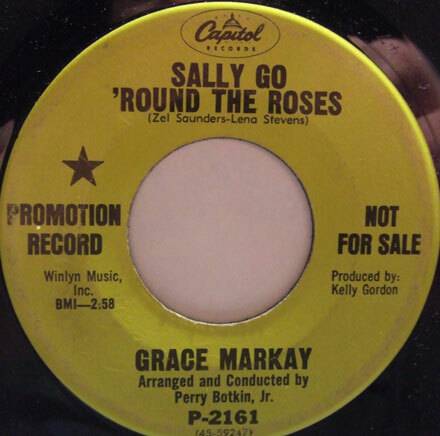 Her version of ‘Sally Go Round the Roses’ was released in the Spring of 1968. It was arranged and produced by Perry Botkin, and it has a Wall of Sound feel that renders it almost psychedelic (though that probably has a lot to do with the song itself). Given the nature of the song this may have been almost unavoidable, but I really dig this version. Markay has a sultry voice, and the arrangement, with layers of guitars, horns, vibes and voices, and an especially cool organ that snakes in and out of the record absolutely begs to be listened to repeatedly on headphones. Botkin took the original 1963 recording as a jumping off point, added several layers of instrumentation to it and stopped just short of ‘too dense’, making for a truly remarkable lost bit of pop genius. I hope you dig it as much as I do. PS Head over to Funky16Corners for some Northern Soul. The tune I bring you today is an old fave that first slipped into my ears by virtue of the old British Psychedelic Trip comps. Back in the olden days, when it was all (or mostly) about the comps, many shipped here from the old sod so that we impressionable youths might fill our heads with beat, psychedelia and the like. We would head into the city and hit up joints like Venus records where the mighty Ron Rimsite would lean over the counter conspiratorially and convince us to empty our wallets so that we could take home with us the latest groovy reissue comp or fanzine. I can’t say with certainty where I picked up my initial copy of the British Psychedelic Trip but I do know that it went a long way into warping my mind. Without those comps I may never have heard the Attack, or Tintern Abbey or any number of amazing freakbeat, psyche or prog bands. 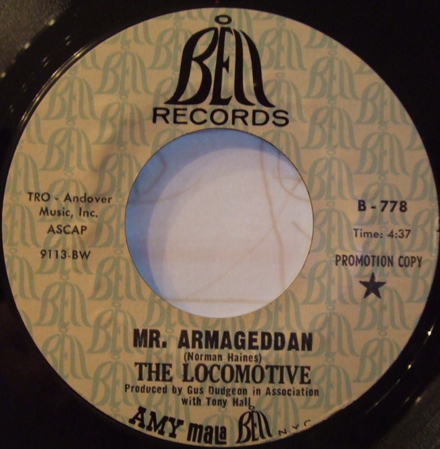 I do know that the first time I heard Locomotive’s ‘Mr Armageddan’ it was on one of those volumes. A perfect example of psyche heading into prog, featuring lots of Hammond organ, wah wah guitar, sneering vocals and bright orchestration, ‘Mr Armageddon’ is classic. 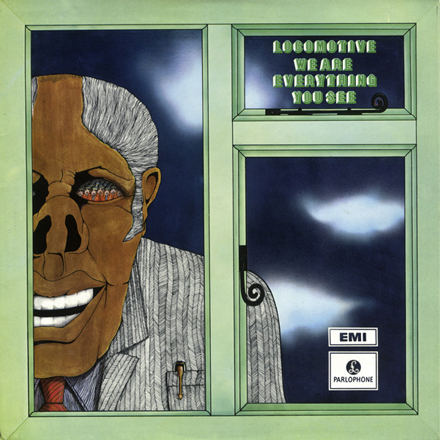 Locomotive were a Birmingham band that made their first mark on the UK charts in a very unusual way. Their first two 45s were actually ska-inspired, with the B-side of the first being a cover of Dandy Livingstone’s ‘Message to You Rudy’. The A-side of their second 45s. 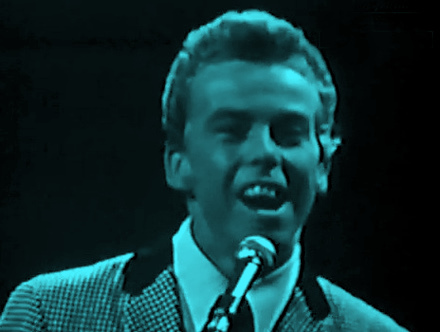 ‘Rudi’s In Love’, a soulful bit of ska was a UK hit. How they found their way from the bright, Island inspired sound of the early 45s to the psychedelic bombast of tunes like ‘Mr Armageddon’ I don’t know, but I dig both sides of their sound. Both ‘Rudi’s In Love’ and ‘Mr Armageddan’ were written and sung by Locomotive’s organist Norman Haines. The band went on to record a full album (which included today’s selection) for Parlophone in 1970. I hope you dig the tune and I’ll see you next week. PS Head over to Funky16Corners for some funky, spacey guitar. The tune I bring you today came to me via my all but insatiable need to explore what might for lack of a better term be called ‘interesting looking’ records. Naturally, when you’re talking about music, one should aim their interests down sonic pathways, but when you’re an inveterate digger (like me) and you’re pawing your way through box after box of 45s and LPs, aside from things you can identify on sight – via label or name – your attention is often grabbed by things that are, how do you say – provocatively packaged. This is not to say that these covers or 45 labels need to be extreme, but rather more importantly, they should be new and/or strange. When I happen upon an album cover featuring a band in certain era-specific togs, or employing similarly timely typography, my fingers stop flipping through the records and I stop to take a closer look. Such was the case when I found the self-titled album by Roxy. The cover was clearly the product of the late 60s (though the name conjured up a somewhat later period) as were the clothes on the band (gotta love those fur-lined coats). 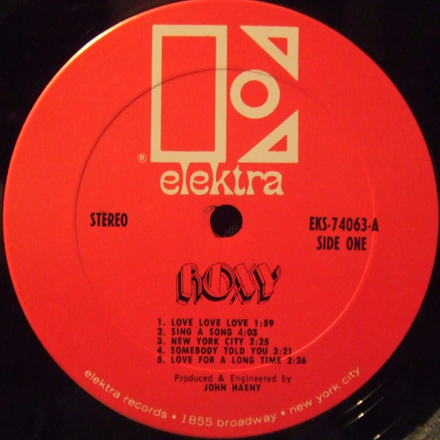 It was an extra added bonus that the album was on an interesting label (Elektra) and that I recognized one of the names on the back (Bob Segarini). Segarini – who appeared in this space once before as part of his pre-Roxy band the Family Tree – is one of those names that always seems to be floating in the distant orbit of California rock. He got his start in a band called the Ratz, which also featured future Quicksilver Messenger Service member Gary Duncan. The Family Tree recorded for RCA, and when they broke up two of the members (Jimmy De Cocq and Randy Bishop) joined him in Roxy. When I got the album home I discovered that much of it didn’t really grab me, except for the obvious exception of the tune I bring you today, ‘Love Love Love’. 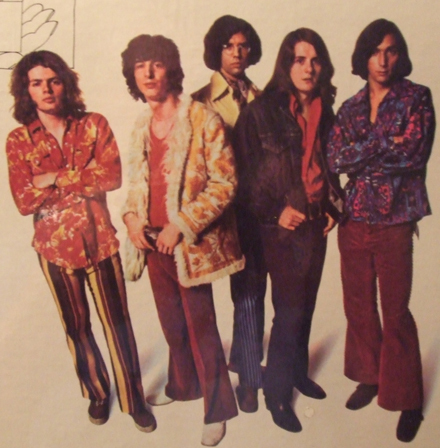 Recorded in 1969, ‘Love Love Love’ has that really groovy transitional sound, in which the 60s vibe is still there, but the sound of the 70s (especially the guitars) is mixing in rather liberally. Where some bands floating in the same transitional soup went off in different (sometimes jazzier, sometimes, folky, sometimes heavy) directions, Roxy has all the markers that would indicate a tighter, pop driven sound, which is ultimately where they would go when they morphed into the Wackers. I hope you dig the tune, and I’ll be back next week. PS Head over to Funky16Corners for an old school organ burner. NOTE: This week we got the sad news that the mighty John Barry, the dean of 1960s film composers passed away. When you get a moment, see his Wikipedia entry for an idea of his vast catalog and influence. I decided to mark his passing by reposting two very different tunes of his that have appeared at Iron Leg over the past few years. I hope you dig them, and I’ll be back on Monday. I hope all is well with you this fine Friday (or Thursday late depending what position you hold on the globe). The tune I bring you today is something groovy with a dash of international intrigue. A variation on the theme from the ‘Ipcress File’ (a different arrangement of the same number appears on the other side of the 45) ‘A Man Alone (Jazz Version)’ is one of my favorite John Barry selections. Barry, who has been featured here before (in his pre-soundtrack era) composed and performed the soundtracks to countless films and television shows from the early 60s on. ‘The Ipcress File’ was the very first ‘Harry Palmer’ film for the mighty Michael Caine and was adapted from the novel of the same name by Len Deighton. The 1965 espionage thriller is a primed example of a swinging 60s take on the ongoing cold war, and Caine is – as always – the very epitome of dry, limey cool. ‘A Man Alone (Jazz Version)’ swings along aggressively with a beatnik edged hi-hat and bongo pulse, before the main theme is stated by the unofficial spy theme instrument of record, the cymbalum (or some variation on the cymbalum/santoor dulcimer-esque hammered thingy), which carried in its tinny strings the very essence of mysterious international intrigue, with the fezzes, lugers, dark Eurasian back alleys and trench coats. Barry does change things up a little (the “jazz version” one would assume) with a decidedly English-sounding horn chart, featuring a just-this-side-of-incongruous alto sax (maybe doubling a muted trumpet?) solo. Sit back, close your eyes and visualize Caine speeding down a dark, rain-slicked street chasing (or being chased by) nemeses from behind the Iron Curtain. I haven’t seen the movie in a few years, and I can’t remember if this piece actually appears in the film. If you know (this means you Bill…), drop me a line. The end of the week is upon us, and I have a special treat for you all. One of the great bones of contention between my lovely wife and I is the movie ‘Zulu!’, the 1964 epic retelling of the Battle of Rorke’s Drift in South Africa. It’s one of the great war/action movies, Michael Caine’s first starring role, and as much as I love it, the wife hates it. Some years back, my man Mr. Luther passed on a tape with a couple of tracks from the soundtrack, one of which I bring you today. For some reason, I used to think that the John Barry leading the John Barry Seven was not the hugely successful soundtrack composer who wrote many of the most famous James Bond related themes, as well as the theme to ‘Midnight Cowboy’ (the famous instrumental, not Fred Neil’s ‘Everybody’s Talkin’). As it turns out they are in fact the same guy. Barry got his start as a jazz arranger, moving on to composing for British teen idol Adam Faith, composing the soundtrack to the cult film ‘Beat Girl’. He went on to work on the Bond films, and then on to ‘Zulu’. 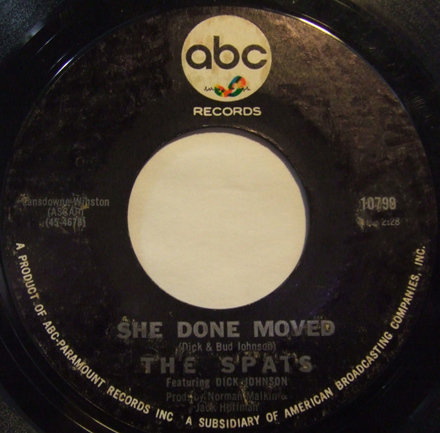 While the theme to the movie – the a-side of this very 45 – is a cool Shadows-esque tune, ‘Monkey Feathers’ takes the whole reverb thing and runs with it, adding a surf-like feel over a martial beat.